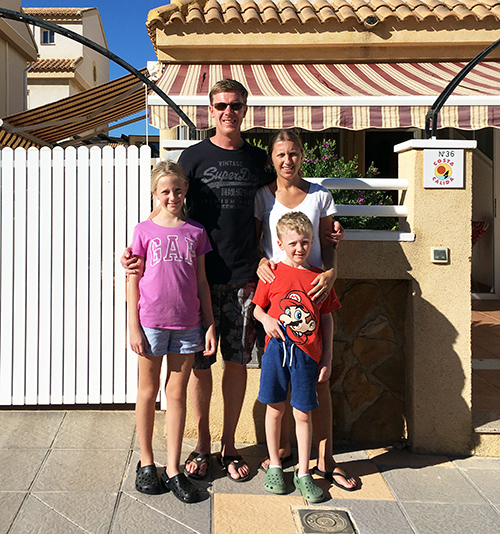 School holidays have got extra fun the Smiles family since they bought a house in the Costa Blanca through HomeEspaña. Dan and Amy Smiles from West Sussex found their perfect holiday home in Torre de la Horadada during a trip to Spain in June 2017. They chose a three-bedroom townhouse, agreed on a purchase price of €137,500 and with the help of HomeEspaña completed the purchase shortly after. The couple has two young children, aged eight and 10, and look forward to visiting their property as much as they can during the holidays. Dan and Amy began their Spanish property hunt back in 2016 when they went visited the Costa Blanca and north Murcia to view properties with HomeEspaña. They didn’t find what they wanted that time but returned in June 2017. “In our first viewing trip we didn’t see anything that had the wow factor,” said Dan. “We saw properties as far south as Lo Pagán and San Pedro, as well as in Playa Flamenca, which we decided wasn’t right for us. When we returned a year later, we upped our budget and concentrated on resorts in the southern part of the Costa Blanca, which is how we found our house in Torre de la Horadada. Dan and Amy’s townhouse is in a quiet street just five minutes’ walk from the seafront and main beach in Torre de la Horadada. Outside they have two terraces and a front courtyard. Torre de la Horadada is the most southerly resort in the Costa Blanca. Together with the adjoining town of Pilar de la Horadada, it combines a quiet old town with beaches and a marina. It’s a more traditional, quieter option to the busier resorts in Orihuela Costa, which are still only ten minutes away. The Mar Menor lagoon and La Manga are also close by.